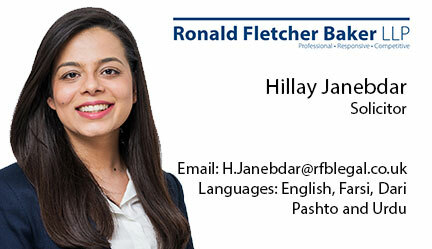 Hillay specialises in Immigration and heads the Immigration Department at Ronald Fletcher Baker LLP. Having worked in Immigration for over twelve years, she has a vast amount of experience in dealing with the points based system including entrepreneur and investor visas, asylum, human rights, unlawful detention, deportation, nationality and European law cases. She has acted for clients from across the world and her clients range from high net worth individuals to those seeking protection in the United Kingdom and human rights claimants including senior politicians and intelligence officers. Over the years she has gained considerable knowledge in this area of the law by representing individuals and organisations in all aspects of their immigration matters including initial applications, extensions, appeals at all levels of the courts and tribunals system, including; the First-tier Tribunal (IAC), Upper Tribunal (IAC), High Court, Court of Appeal and the European Court of Human Rights; as well as sensitive terrorism matters at national and international scale. Hillay also has over five years of experience in Property Law and has assisted clients with real estate and commercial matters, including business acquisitions.